Andalucía often acts as a synonym for Spain as a whole: a sun-dappled, fiesta-loving land of guitar-wielding troubadours, reckless bullfighters, feisty operatic heroines and Roma singers wailing sad laments. 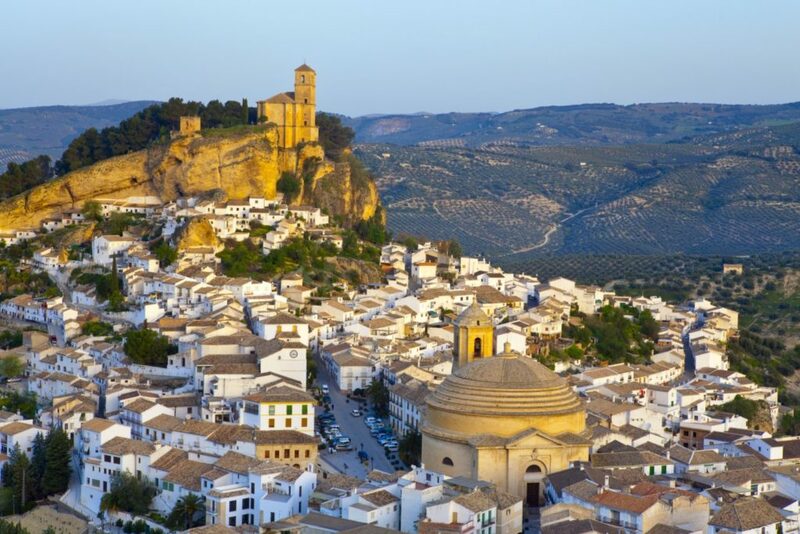 Despite creeping modernization, this region remains a spirited and passionate place where the atmosphere sneaks up and envelops you when you least expect it – perhaps as you’re crammed into a buzzing tapas bar or lost in the depths of a flamenco performance. For eight centuries the region sat on a volatile frontier between three faiths and ideologies: Christianity, Judaism and Islam. This cross-fertilization produced ancient mosques and synagogues transformed into churches; vast palaces replete with stucco work; a cuisine infused with North African spices; hammams and teterías (teahouses) evoking the Moorish lifestyle; and a chain of lofty white towns that dominates the craggy landscape, from Granada’s tightly knotted Albayzín to the hilltop settlements of Cádiz province. Significant stretches of the region’s coast remain relatively unblemished, especially on Cádiz’ Costa de la Luz and Almería’s Cabo de Gata. Thirty per cent of Andalucía’s land is environmentally protected, much of it in easy-to-access parks, and these conservation measures are showing dividends. The Iberian lynx is no longer impossibly elusive; the ibex is flourishing; even the enormous bearded vulture is again soaring above Cazorla’s mountains. One of Andalucía’s most intriguing and mysterious attractions is the notion of duende, the elusive spirit that douses much of Spanish art, especially flamenco. Duende loosely translates as a moment of heightened emotion that takes you out of yourself, experienced during an artistic performance, and it can be soulfully evoked in Andalucía if you mingle in the right places. Seek it out in a Lorca play at a municipal theatre, an organ recital in a Gothic church, the hit-or-miss spontaneity of a flamenco peña (club) or Málaga’s remarkable art renaissance. It is this type of experience that Spanish Links Tours wishes to craft on your behalf. Seville: A City of Contrasts Discovered On Foot: Your guided tour will begin with a visit to the Réal Alcazar, the most ancient royal palace still in use in Europe, built by the Moors over 1,000 years ago. Then you will discover Seville’s Cathedral, the third largest one in Christianity, as well as one of the richest. Inside, you will be able to admire the tomb of Christopher Columbus, then climb the Giralda Tower, a former minaret and today’s symbol of Seville. Following a lunch of local specialties, you will walk Seville’s medieval Jewish quarter and the Palace of Pontius Palate, one of the most beautiful Renaissance palaces in Seville. Before your visit ends, you will have a chance to shop the local markets and boutiques for hand-painted ceramics, leather goods, and cookware such as paella pans. (Our expert guides will make sure that you purchase locally made goods—not copies made in China). If you decide to prolong your stay in Seville, we highly recommend an evening of tapas and flamenco, two of most popular traditions of the region. At sunset, our guide can walk you through the charming Santa Cruz quarter, where you will stop at a typical tavern for wine and tapas. There’s no end of tapas to sample, since Seville is “the capital” of tapas. To conclude the evening, we can arrange for you to see an authentic flamenco presentation. Once the greatest city west of Constantinople (today’s Istanbul), and the seat of Europe’s first university, Cordoba merits a day or two on your trip in southern Spain. 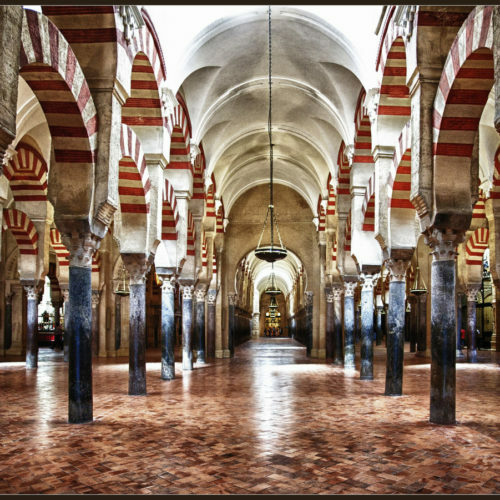 The least well-known of Andalucía’s three great Moorish cities, Cordoba is best discovered on foot. Our expert local guide will bring to life the history of this site-rich town, starting with the 1,200-year-old Mezquita, once the Western world’s greatest mosque. As you wander through the medieval Jewish quarter, going back to the era of Romans and Goths, you will see many monuments linked to the most important personalities of Cordoba, including the Roman philosopher Seneca, the Arabian philosopher Averroes and the Jewish philosopher Maimonides. You will also visit one of the few remaining synagogues left in Spain, built in 1315. Take time to linger and photograph the Alcazarde los Reyes Christianos, known for its topiary, classical statues, fountains and pools, as well as it stunning mosaics. To complete your visit, you will want to see the Museum of Fine Arts as well as a gallery featuring the works of Julio Romero de Torres, a local painter whose dark-eyed beauties dominate every postcard rack in the city. 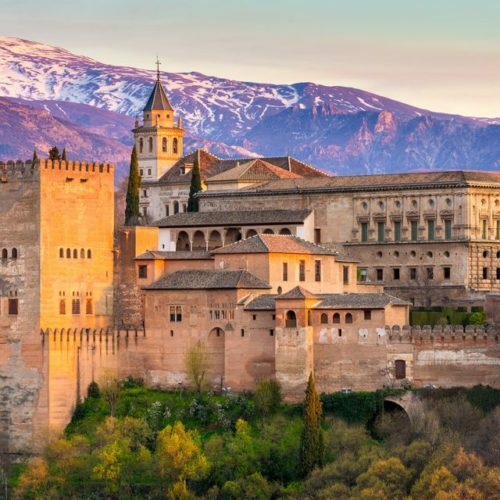 Of the 1,000 places you need to visit in your lifetime, put the celebrated Alhambra on your list. Our skip-the-line morning visit includes a tour of the Alcazaba Fortress and the Generalife Gardens. Built in the 13th century, during the Nasrid dynasty’s reign, the Alhambra originated as a fortress and became enhanced over the centuries with palatial buildings, courtyards, and lavish gardens added by successive rulers. Now a UNESCO World Heritage site, the Alhambra is a fascinating place to explore with endless architectural wonders. With our expert guides, you will discover the Moorish architecture of Alcazaba Fortress and the three Nasrid palaces—Mexuar, Serello, and Harem. 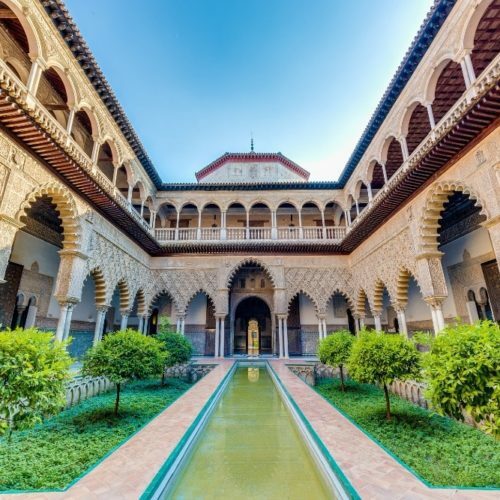 Head inside and marvel at the intricate Islamic artwork before visiting the Palace of Charles V. You will also tour the Generalife Gardens and imagine the Moorish rulers who once relaxed and entertained in this exquisite setting. Following a lovely lunch, we suggest you make your way to Granada’s Moorish Baths—Hammam Al Andalus—for a blissful soak. Spend a delightful afternoon relaxing in the hammam’s seven different pools, all beautifully decorated. And to off the afternoon of ultimate indulgence, you can also enjoy a traditional Arabian massage with natural aromatherapy oils. Naturally you don’t have to limit yourself to these travel experiences. Just reach out to [email protected] for additional ideas and information.